As a child, artist Christopher Marley was afraid of bugs! But now he travels the world to study them, collect them, and arrange them into dazzling works of art. 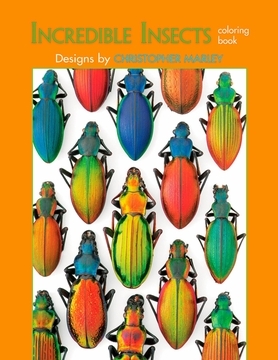 You’ll find twenty-two of his insect images in this coloring book. They are shown as small reproductions on the inside front and back covers. You can have fun creating insect art, too, by copying the colors as arranged by Christopher Marley or by using your own favorite colors. Each drawing is accompanied by a question about the insects—the answers are printed upside down on the back of this page.